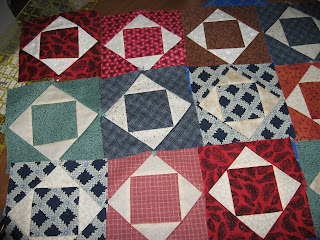 Here are a few of the blocks I've done to recreate that beautiful museum quilt that Stitchinjoy found and took pictures of. Mine won't be done as quickly as Joy's. I am making 2 blocks a day. Late in 2009 I should have the top done. The blocks will be alternated with soft beiges & creams and set on point. As I look thru my stash I see more and more fabrics I can use in this quilt.